Employed in public administration – since 2011. Mrs Strok-Sadło has had a rich experience in assessing risk factors as well as managing projects, teams, and sales processes, which she gained while being employed on managerial positions in numerous financial institutions, such as BRE Bank S.A., Deutsche Bank Polska S.A., BPH S.A., Svenska Handelsbanken AB S.A. In the City of Lublin Corporation Mrs Strok-Sadło is responsible for supporting cluster-related initiatives. 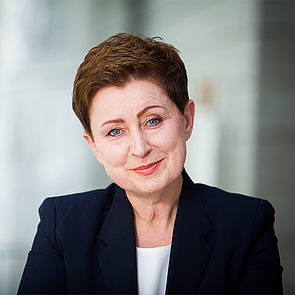 Since January 2014 she has been the Management Board Member of Lublin Medicine – Medical and Wellness Cluster which was originated under a Partnership Agreement signed by The City of Lublin and Medical University of Lublin. Currently the Cluster associates more than 100 members. Lublin Medicine Cluster is a cooperation platform of higher education institutions, research centers, healthcare entities, individual entrepreneurs, institutions for collaboration and local authorities. Effective management of resources in the field of medicine and health is one of main priorities of the European Union. Clusters representing medical industry should play the key role in that process. International cooperation of clusters may give a deeper insight into the current status and the future of medical and health sciences. It should also accelerate the implementation of social, organizational and technical innovations. Lublin Medicine Cluster is constantly developing the idea of regional, national and international cooperation. The presentation will give some examples of already pursued activities which may be further developed in a broader partnership.